Artist's Way Workshop - Spring — Sozo Group, Inc. This workshop is aimed at freeing your creativity. Discover (or rediscover) your creative self! Yes, you can! 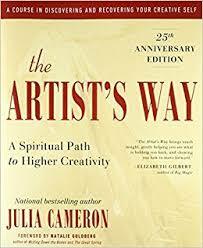 This 10-week workshop is based on "The Artist's Way" book by Julia Cameron. Self-care is the focus of the course...suggesting that you to take yourself on little creative adventures for 1....known as “Artist Dates”… it’s just an eye opening experience! The art projects each week are simplistic - intended to "stir" the creative process...there is no formal art instruction. Instead, participants will explore different mediums and materials as "play." The focus of the artwork is NOT the final product but on the “process” of creating something and being unblocked. It involves fellowship, discussion and reflection about what we are learning in the book. In the past workshops, we’ve colored, painted, stamped, made jewelry….mosaics, watercolors, oil pastels, mixed media, scratch art and much, much more! SEE IMAGE ABOVE FOR ART EXPLORATION SCHEDULE. Have a couple of conflicts? No problem, you can miss a couple classes and still be able to function, as long as you're reading the book. Workshop Fee - $100 (includes materials for each week's art projects). Proceeds will benefit Sozo Creativity Center. REGISTER IS BELOW (Add to Cart). Why are we charging? We have expenses (materials, space, advertising, websites, etc).... but please realize we are not charging for our time. The book can be bought on Amazon for under $20 or at used book stores. 10 Week Workshop. No Classes on 4/22 - Easter or 5/27 - Memorial Day, 6/17 is last session.